I took a deep breath and headed down the stairs to survey the damage. 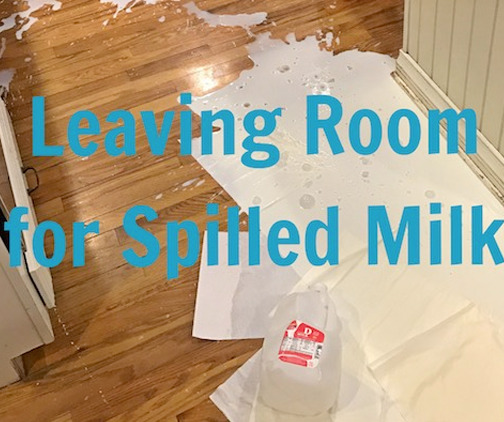 When I saw the empty gallon of milk sitting in a lake of milk and egg nog on the floor, my vision of making pancakes on our last lazy morning of Winter break drained out as quickly as the milk had poured across my kitchen floor. These moments happen frequently, cereal spills, paint on the walls, foreign objects in the toilet, fully clothed children in the bathtub. In an instant, calm unravels and chaos ensues. Unfortunately, my response to mess and mayhem is often much like this morning’s milk spill. My emotions come pouring out like uncapped milk until they have covered everything in their wake. Then, I must start the ugly process of trying to clean up the mess I have made, but there is no way to pour my words neatly back into a gallon jug. They have soaked in before I can take them back. This morning God gave grace. I did not yell or criticize. I did not explode or fume. I calmly soaked up milk and thanked the children for running for towels. After all the milk was cleaned up, breakfast was eaten and children had gone off to play, I sat down in the quiet of my kitchen and wondered why many days, despite my desire to remain calm, my big emotions spill out like milk instead. Why, when I long for my words to nourish, do they spill out like sour milk? Why, when I know that anger does not produce the righteous life that God desires, does anger pour out onto those around me? When reality collides with my expectations, I become easily frustrated. The perfectionist control-freak inside of me feels slighted that things are not going according to plan. So often I forget to leave a margin for the unexpected to occur. When I have zero margin due to a crowded schedule or limited resources, I have no room to handle the inevitable chaos that occurs in a houseful of 5 spirited children. Milk spills and missing shoes, sibling scuffles and missed school busses become calamities when they should merely be bumps in the road. Without margin for rest, I neglect to spend necessary time with the Lord and I fail to take proper care of myself. As I sacrifice time with the Lord, my tank becomes dangerously empty for the moments I need an extra measure of grace. When I am running on fumes, my spirit becomes irritable and when disaster strike, irritation comes spilling out like spoiled milk. I must not allow myself to get to empty. I must not allow life-giving time with the Lord to take a back seat to an overcrowded calendar. I must learn to say no in order to preserve margins of time and energy for the unexpected, but inevitable moments of chaos.